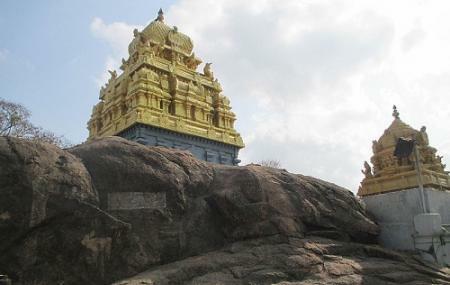 Find hotel near Patalathri Narasimhar Tem ..
One more to the list of Chennai temples dedicated to Lord Vishnu, the Patalathri Narasimhar Temple boasts of a beautiful architecture strategically constructed atop a boulder. An 8th century creation, this temple was built by the South India dynasty of the Pallava. While anytime is a good time to visit the temple, experiencing the festivals of Chittirai Brahmotsavam, Narasimha Jayanthi, Pavithra Utsavam and the Maasi float festival is something really unparalleled. On full moon days too there are special rituals at the temple. How popular is Patalathri Narasimhar Temple? People normally also visit India Seashell Museum while planning their trip to Patalathri Narasimhar Temple. People also prefer to start their day with Patalathri Narasimhar Temple. One of the important temple for Lord Vishnu. In this temple the God has Third Eye. The Deity is carved from the small Hill. We have to visit this Temple for God's Showers of Blessings. One of the oldest temple in TamilNadu. Very near to the GST road and railway station ( Singaperumal Koil). Divine place.. apt for some one looking for giri c Valam..